Quilt Show Intake and Outtake Procedures. By now most of you will have received your quilt A/B forms with instructions on where to place Part A of the form on your quilt and drop off times. The Insie/outsie committee will then look after sorting them, handing them off to the Upsie/downsie committee, and affixing the information cards to each quilt. In an effort to return quilts as quickly and smoothly as possible, we will be implementing a new procedure. After the Upsie/downsie committee has returned all the quilts to the central area and have been sorted we will begin the return process. We ask that you form a line outside the door where you initially dropped your quilts off on Thursday. Members will be received one at a time, present their Part B forms, and a runner will then get the quilts for you. You will be required to initial receipt of your quilts and you can then exit the arena through the main entrance. In the event of rain, the lineup will be reversed I.e., you will line up in the outer ring of the arena and exit through the outside door of the registration area. We anticipate that this process will not take any more time than it has in previous years and will be much less chaotic for everyone. Looking forward to another great show! Arrangements have been made to have the concession stand open for Thursday during our quilt show set up so we can grab lunch or beverages throughout the day. Please remember to wear your WQG nametag during the quilt show while you are volunteering. We have some chatelaines to wear as well. Don’t forget to pick up your voting ballot Thursday night or Friday. 2019 Quilt Registration Form in PDF format. Click here to open. Options are filling out online & emailing (may need app if using iPad/iPhone), printing & filling out form and then scanning or taking a picture and mailing digital copy or handing in or mailing hard copy. Block Game: Revealed by Gail Hogarth who is the coordinator for the game. You can sign up and receive a sealed envelope with instructons to make a 10 x 10 inch block with a designated colour binding which will eventually be made into a large pictorial quilt. The block game is based on our quilt show theme: Piece! Quilt! Love! Deadline is December Tea. Guild Challenge: Revealed by Allison & Cathy. See Allison to sign up and for a mere $2, you will receive a kit to help you to make something fabulous with the theme of LOVE – something you love or something that makes you happy. It is meant to be a small project, like a wall hanging, purse, runner etc. no larger than 650 square inches (or 25” square). Deadline is March 2019 meeting. Each partcipant chooses a kit which contains fve 7.5” strips. At least half of each strip must be used on the front of a quilt ofy our choice. The finished quilt must be at least 50 x 70 inches, or it can be larger if you wish. 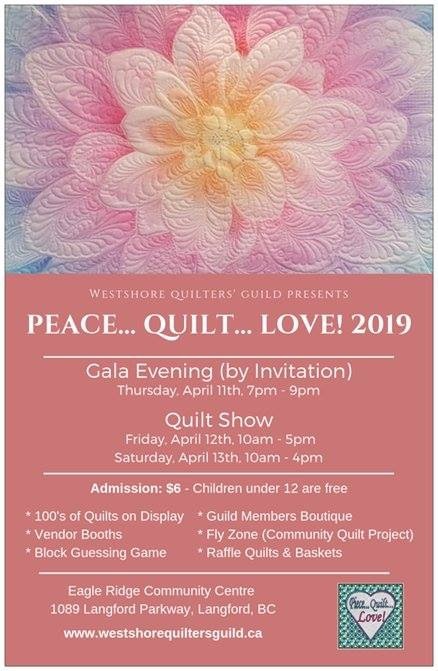 The deadline for quilts to be turned in is the March 28, 2019 Guild meetng. There is a refundable deposit of $5.00 for each kit. If you do not turn in a quilt at the end of the challenge period, your deposit will be forfeit. Any deposits not claimed will be used by the Charity Society to purchase supplies for future charity quilts. All finished quilts will be on display at the 2019 Quilt Show. A rosette will be awarded to the winning quilt as decided by Viewers Choice. Batting will be supplied by the Charity Society. Contact Sue Sharock at ssharock@shaw.ca with the amount required.